CyberBingo is a veteran of the online bingo scene; promising â€˜bingo at its bestâ€™, it was launched in 1996 and like Bingo Mania, welcomes players from North America. The site is owned and powered by Vista Gaming, whose software is also used by BingoSky, Bingo Bingo and Rainbow Bingo, to name but a few. 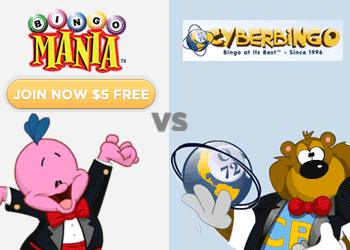 Both Bingo Mania and CyberBingo have enjoyed top honors over the years. American players are certainly impressed by the games on offer, as CyberBingo has won both silver and gold â€˜Top Bingo Siteâ€™ awards from Gambling Online Magazine annually for six years straight. In 2010, CB celebrated an impressive milestone of one billion games played to date! Despite its name, Cyber Bingo doesnâ€™t have a futuristic or space-themed appearance to its site or games. The look of the website is bright, colorful and cheery and the siteâ€™s mascot comes in the shape of a furry cartoon bear, who looks like he might have eaten a few too many donuts. He is known as the lovable CB Bear. Quite cute like Skippy the Bingo Mania mascot. At Cyber Bingo, you donâ€™t have to wager much to win big as bingo cards can be purchased for as little as $0.05. As for the prizes, there are regular jackpots of $10,000 as well as a $25,000 Bingo Freeroll room featuring free bingo games each evening. There are eight bingo rooms to choose from, many of which are open 24 hours a day. Here you will find regular bingo games, tournaments and unique bingo events. Cyber Bingo offers American-style 75 ball bingo as well as European-style 90 ball bingo. Your cards are automatically daubed for you (although you can opt to daub them manually), and even if your internet connection drops out, you will still be credited if you win. CB offers its players â€˜a complete online gaming experienceâ€™ so why not try out some of their online slot games and casino games? There are 25 different types of slots available, which include classic slots, video slots and arcade slots, plus you will find famous names and favorites such as Lucky 7â€™s and Wild Cherry. There are 10 types of video poker on offer, where you can choose to play between one and ten hands in games like Deuces Wild 2 and Double Joker Poker. Over in the Casino Room, Las Vegas fans will find nine exciting games to choose from, including baccarat, blackjack, Texas Holdâ€™em, and both American and European versions of roulette. Customer service is available 24 hours a day via both live chat and email, and the staff are extremely knowledgeable and helpful. There is also a very comprehensive list of FAQs, plus help sheets on how to play all the different types of games available which are great for newbies. If you are new to CyberBingo, there are plenty of payment options available for funding your account; these include VISA, MasterCard, Neteller, InstaDebit, iPoint, Ukash, MyVoucher, MonkeyBookers, Cyber Bingo gift cards and bank transfer. Join today and you will receive a 500% bonus on your first deposit, which could fund you to play your favorite game for hours on end. Both CB and Mania have stood the stand of time as two of worldâ€™s leading communities. Over the years, both sites have done their part to make playing online bingo an entertaining experience.